You know I’m not a dessert person. But, when my freezer gets cluttered up with brown, brown frozen bananas I gotta do something. I defrost the bananas on the countertop for a few hours, peel the soggy fruit, and make a favorite recipe. For years, I tried hard to emulate the Queen Elizabeth Hotel‘s version–dark, dark brown with burnt sugar flavour. Norene Gilletz‘s recipe in The Pleasures of Your Food Processor is a stellar version. 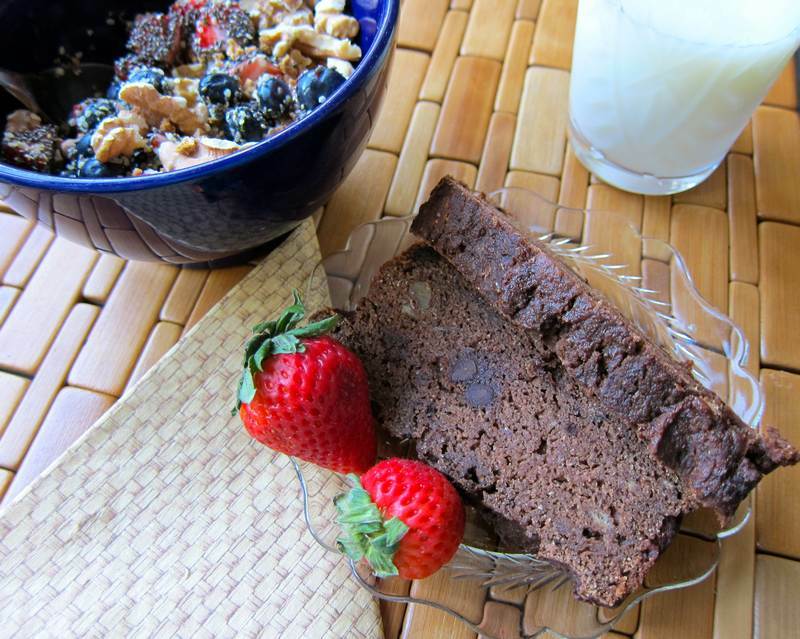 Recently, I got hooked on my yoga friend Marie-Catherine‘s ultra-healthy banana bread. But now, I’m on a mission. 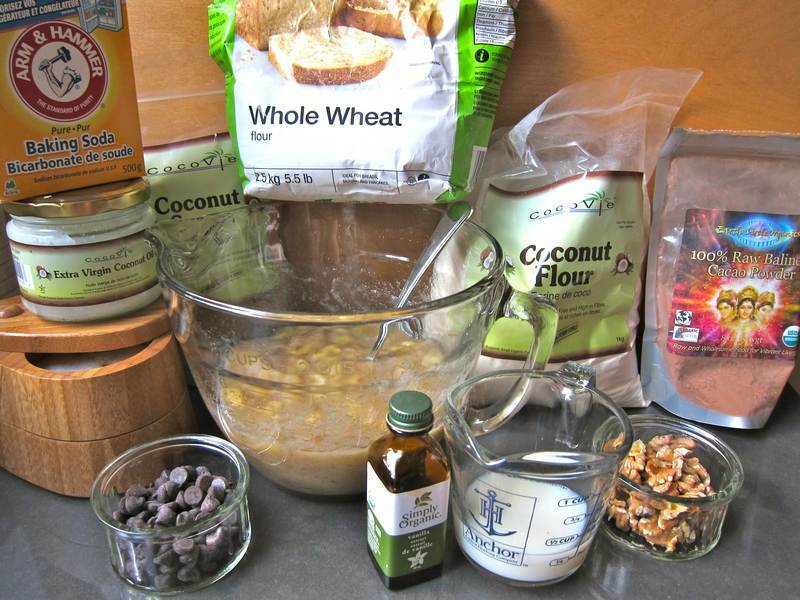 Here’s my mission: Just how many Cocovie coconut products can you squeeze into 1 recipe? Hmmm, let’s see. Coconut oil, coconut flour and coconut sugar. If you want to get fancy, you can spread a layer of coconut jam on your slice of Chocolate Coconut Banana Bread. Preheat the oven to 350 degrees. Prepare a loaf pan by coating lightly with coconut oil and set aside. Mash the bananas, and mix with the liquified coconut oil, milk, sugar and vanilla. In a medium-sized bowl, combine the flour, cocoa, baking soda and salt. Add the wet ingredients to the dry, and mix just until combined. Apparently, over-mixing can ruin the texture. 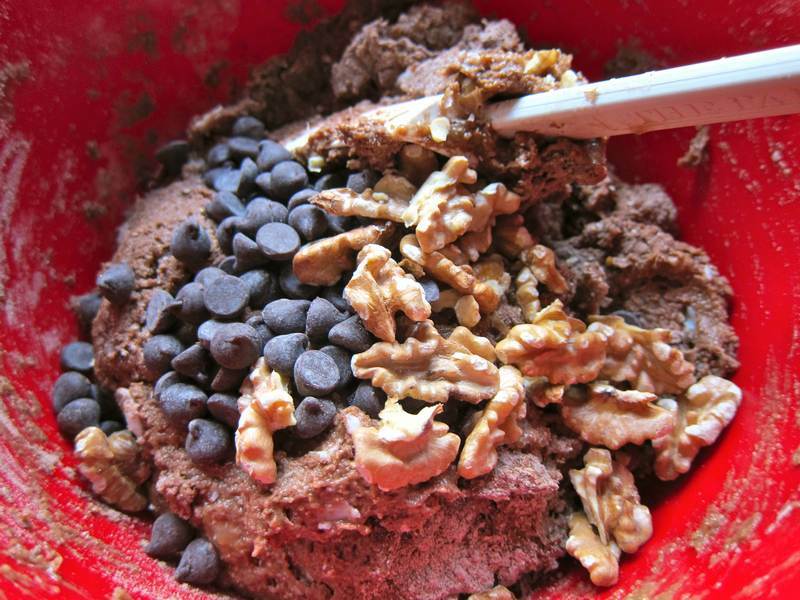 Stir in the chocolate chips and the nuts, then pour batter into the prepared loaf pan. Bake for 55 minutes or until a pointed knife comes out clean. Check out the inspiration for this version of banana bread: Vegan Double Chocolate Banana Bread by fooddoodles.com. Coco-notes from Anne of Cocovie: Coconut flour is gluten-free, so it so needs a lot of oil and eggs in a recipe if you want it to bind. As a guideline, if you are COMPLETELY replacing any flour with coconut flour, the measurement is 1 cup regular flour = 1/3 cup coconut flour (in being gluten-free it absorbs a lot of the liquid). 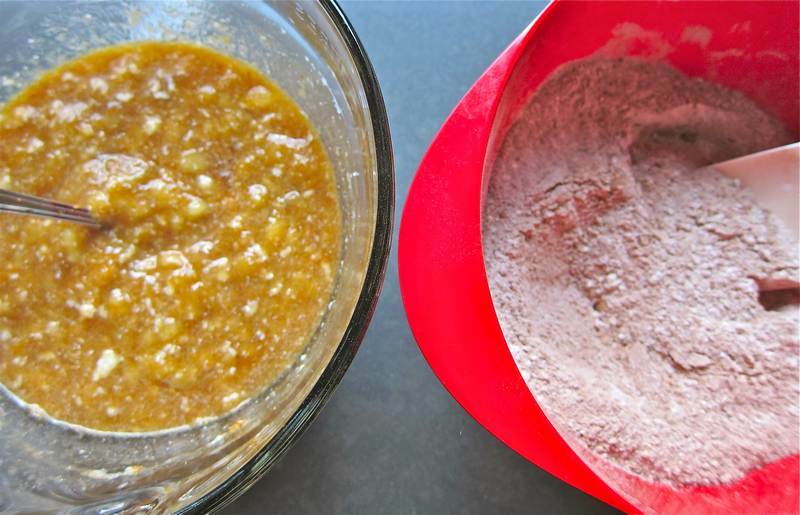 If mixing with regular flour it is okay to replace one to one ratio. If you have questions about this, ask away in the comment section. Anne will enlighten us all. Try to make sure you have company coming when you make this Chocolate Coconut Banana Bread or else you’ll run the risk of eating a bit too much of it by your lonesome. Need a quick, cheap mini-facelift? Check this out. Thanks to Kacey Rose Bains, of Epicentre Training, for procuring these Cocovie coconut products for Jittery Cook experimentation. It is fun to embrace new foods. I’m off chocolate…..I overdosed last week. Oh well. There’s always next week! Thanks for 2 comments! I love comments!! Absolutely true that coconut oil needs to be paired carefully with foods that are complimented by its tropical scent.